Tater tots. One might file them under guilty pleasures because they conjure memories of the grade-school cafeteria. They also sound like they&apos;re named after a Parker Brothers board game. (Sidenote: did you know that "Tater Tots" is a registered trademark?) Taken altogether, eating tater tots ranks down there with playing laser tag as activities that reaffirm our adulthood. But can you deny their appeal? The potatoes are grated, clumped together, and dipped in the fryer. The uneven surface lends itself to an outer layer that is crispier and more golden-brown than the common french fry. Inside, the looseness allows for a juicier bite, as opposed to the starchiness of a spud intact. 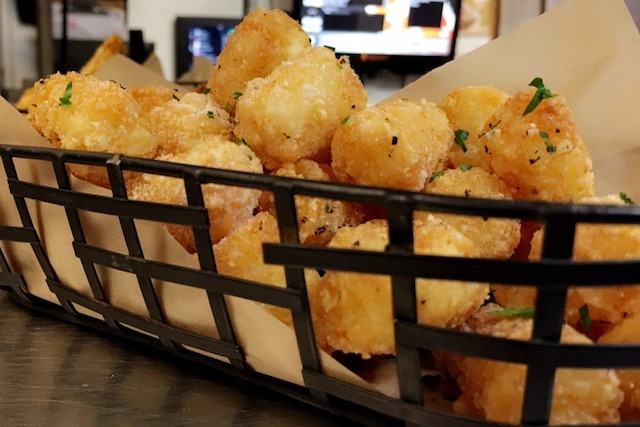 So let&apos;s stop denying it: we love tater tots. And, in celebration of this grand proclamation, here are some of our favorite tots in Los Angeles. Potatoes, while technically vegetables, are also very starchy, meaning they&apos;re hearty in their own right. The tactic at Belly & Snout, then, is to cut through the monotone richness. 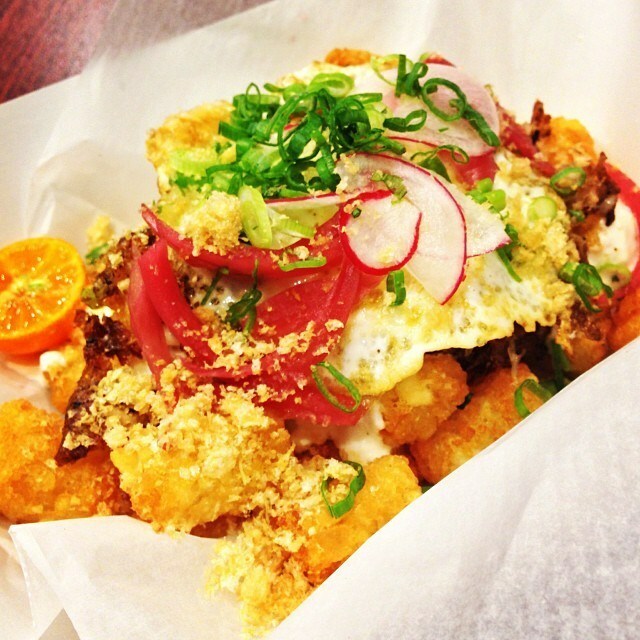 Their sisig tots may be packed with pork belly, pork snout (! ), chicharron, and garlic crema, but the fat is contrasted with the sharp pinch of red radish, pickled red onion, peppers, and a slice of calamansi (a lime that&apos;s commonly found in Filipino dishes). The oxtail chili tots, likewise, is garnished with jalapeño to bring some primary colors to your taste buds. Belly & Snout is located at 974 S. Western Ave. in Koreatown, (323) 643-4170. Check your paleo diet at the door; Rose City strives for Dionysian-levels of indulgence. 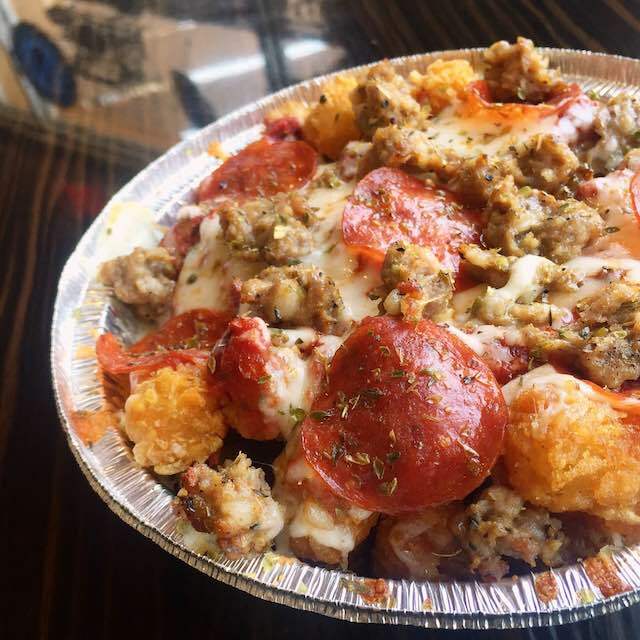 And, as far as we know, they&apos;re the first in L.A. to have stumbled on the idea of pizza tots, which is a pan of tater tots dressed in mozzarella, sausages, and pepperoni. "Frankenfoods" leave us a bit wary at times, but this combination makes sense when you consider how the potato—with its understated flavor—pairs well with almost anything. And if you&apos;re not feeling like pizza, there&apos;s also the cheeseburger tots, which are topped with seasoned beef, melted cheddar, Thousand Island dressing, lettuce, and diced tomatoes. Another local favorite is the buffalo tater tots, which include a helping of diced chicken sautéed in Rose City&apos;s very own wing sauce. Rose City Pizza is located at 3588 Rosemead Blvd., Rosemead, (626) 280-8885. There&apos;s no way to reinvent the tater tot. It&apos;s appeal is so singular that you&apos;d have to be crazy to even attempt it. But, as The Craftsman has shown, you can push the bar for perfection with a bit of culinary cunning. The restaurant&apos;s secret is vinegar powder, which adds a tang to compliment the richness of the tots. The Craftsman&apos;s handlers tell us that the vinegar fights "palate fatigue," overriding that part of your brain that desensitizes your taste buds. In other words: these tots are made to be (literally) irresistible. If you want even more of a kick, there are the spicy tots, which are dusted with a number of chili powders, along with complimentary spices that the mad scientists at The Craftsman are keeping confidential. The Craftsman is located at 119 Broadway, Santa Monica, (310) 573-8426. Does the term "gastropub" even mean anything any more? It had once referred to a new brand of American cuisine that espoused a broader worldview. Now, it describes any joint that partners cheeseburgers with craft beers on tap. Public School, which has four locations in SoCal, revives that former spirit of discovery. And while their popular bacon cheddar tots aren&apos;t as surprising as, say, their chermoula chicken or roasted poblano with quinoa, the potatoes are given the same level of attention. Public School tells us that every, single, one of their tots is made by hand in-house. 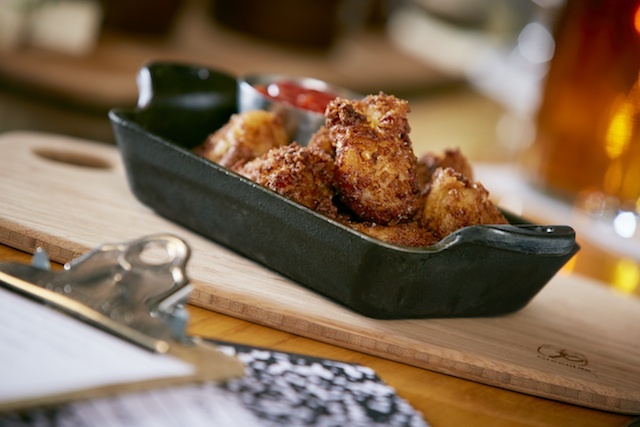 The bacon cheddar tots are infused with (of course) bacon and cheddar, and served up with a sriracha ketchup that adds a pang to offset the indulgent flavoring. There are Public School locations in downtown L.A., Culver City, Thousand Oaks, and Sherman Oaks. The ultimate childhood dream was to eat your favorite food for breakfast. Ice cream at sunrise? Laffy Taffy as the roosters are crowing? The idea smacks of a careless abandon seems very adult. 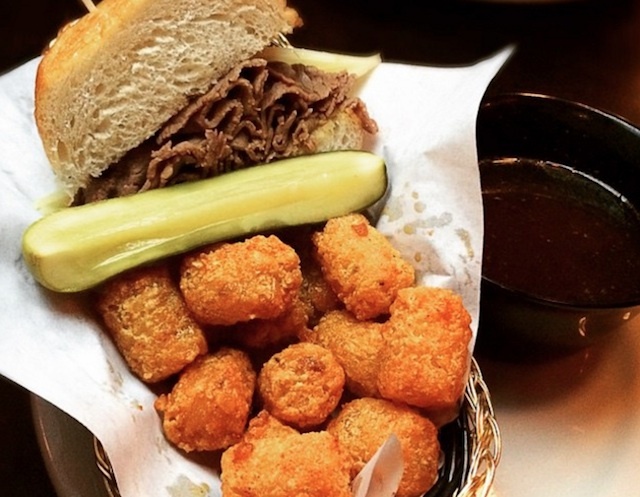 Well, if tots are your thing, then Le Roy&apos;s will be a smash with your inner, 10-year-old self. 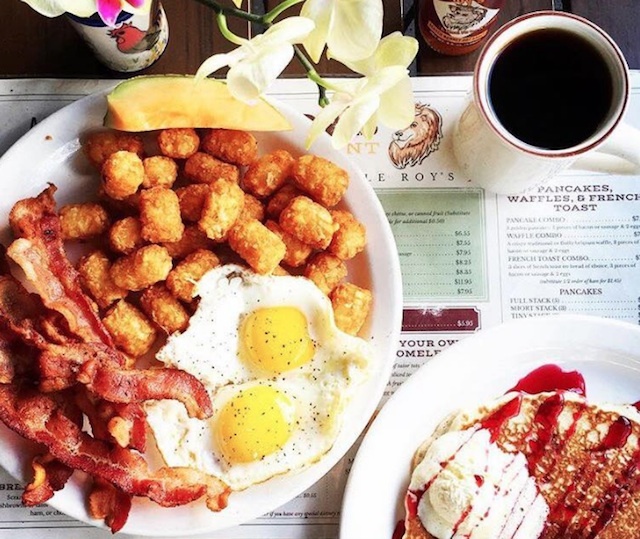 You can swap out the usual home fries and hash browns for tater tots, which means you can pair the restaurant&apos;s crisp, golden tots with a Belgian waffle, corned beef hash, an avocado omelette or a BLT sandwich. You can even plop down a hunk of pork chop, because you&apos;re an adult now and you&apos;re the one writing the rules. Le Roy&apos;s is located at 523 W. Huntington Drive, Monrovia, (626) 357-5076. The Oh My Gaga food truck, which has canvassed the L.A. and Orange counties for more than three years, takes a direct approach to their tots. Co-founder Clare Shimasaki tells LAist that the basic goal is to create a tot that is "[perfectly] crunchy on the outside but warm and soft on the inside." It&apos;s a fail-safe directive when it comes to potatoes. It couldn&apos;t hurt, also, to dress them up with the fixins&apos;. 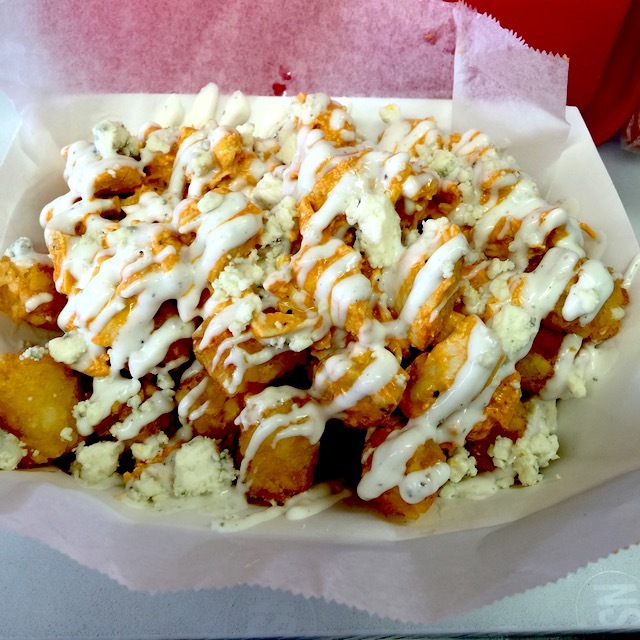 Their "loaded" tater tots are topped with shredded cheddar, bacon, sour cream, and green onions. And their buffalo chicken tots are garnished with buffalo chicken and ranch dressing, with blue cheese crumbles as the added wild card. You can track the Oh My Gaga food truck on Twitter. When there are hot dogs, there are usually tots somewhere nearby; it&apos;s a well-known phenomena that has been documented by foodies of yore. And certainly there are a lot of hot dogs at Fab in Reseda. In fact there are nearly 20 different dogs on the menu—including a variation on the Rueben sandwich—as well as some options for bratwurst. 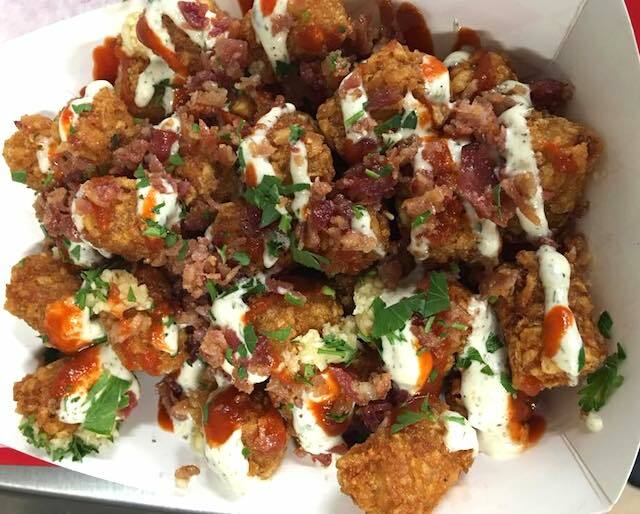 Their Fab tots, not to be outdone by their flashy sausages, are tossed with fresh, chopped garlic, doused with a ranch dressing, and garnished with sriracha, bacon bits, and crushed red chili peppers. OK, so maybe the summer heat isn&apos;t the best setting for spicy tots, but the dish is also a good alibi for ordering one of Fab&apos;s milkshakes, or even their root beer float. Fab Hot Dogs is located at 19417 Victory Blvd #12, Reseda, (818) 344-4336 and 28255 Newhall Ranch Rd. (in the Gateway Village Shopping Center) in Valencia, (661) 607-0333. By now you think you know everything about Cole&apos;s. You know that they&apos;re the supposed progenitors of the French dip sandwich (or maybe not?). You also know that the Varnish, one of L.A.&apos;s most hallowed cocktail joints, is nestled somewhere in the restaurant&apos;s storage closet. But perhaps you&apos;ve overlooked the tater tots? As with everything Cole&apos;s, there&apos;s nothing too ostentatious about the spuds; they&apos;re just done exceptionally well. The tots are encased in a golden-brown shell that takes the faintest pressure to break. And, for the garlic lovers of the world, you can order a batch of spicy garlic fries and switch out the fries for tater-tots. The battle between Cole&apos;s and Philippe may be forever, but if you&apos;re a tots lover you know where your allegiance stands. Cole&apos;s is located at 118 E. 6th St. in downtown Los Angeles, (213) 745-7090. Snobs may deride the potato for being too unoffensive. We prefer to think of them as being versatile; it&apos;s hard to think of a cuisine that hasn&apos;t found a way to integrate them. As such you might say that, for Seoul Sausage Co., where traditional Korean fare is introduced to American casual, the potato serves as the middle-ground. This cross-cultural exchange is evident in their galbi poutine. The fries (which can be substituted with tots) are topped with pickled onions, cheese, avocado lime crema, and galbi—short ribs that have been braised for a steady 8 hours. If this seems a little too filling to you, there are also the plain house tots that come with the restaurant&apos;s "DMZ sauce," which, as divulged at food blog Doah&apos;s Hungry, is a mix of garlic, jalapeño, kim chi, and sriracha aioli. Seoul Sausage Co. is located at 11313 Mississippi Ave. in Sawtelle Japantown, (310) 477-7739 and 236 S. Los Angeles St. Unit G in Little Tokyo, (213) 935-8677. They also have a food truck that you can follow via their homepage. The Black Sheep is touted for their carne asada tots. What? You need a detailed description of what it tastes like? You want a bullet-point breakdown of every herb and spice that goes into the dish? 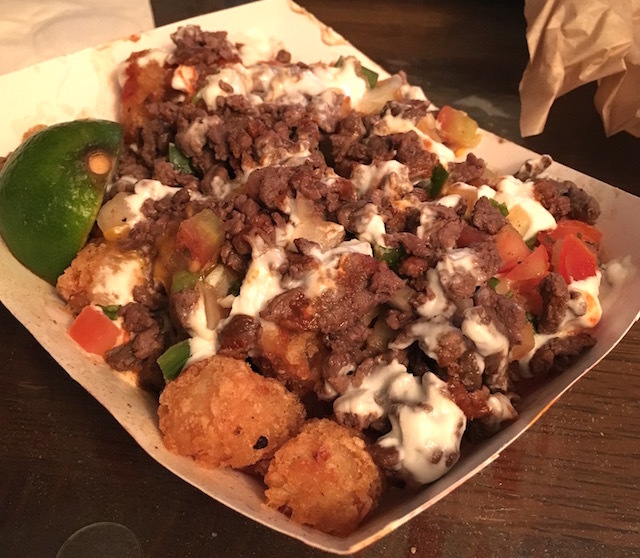 Come on, the phrase "carne asada tots" is a reason unto itself. And if you&apos;re somehow adverse to grilled meats, there are also the truffle cheese tots and garlic parmesan tots (both very delectable) to satisfy your your hunger pangs. The Black Sheep is also know for their massive burgers, which are about the size of an ottoman. So, all things considered, it&apos;s practically criminal to leave unsatisfied. The Black Sheep is located at 126 E. 6th St. in downtown L.A., (213) 689-5022. Sonic is like the chupacabra for many Angelenos: often heard of, but rarely seen. You may know of the chain from their ubiquitous commercials in which two guys (who seemingly don&apos;t have day jobs) sit in their car and dissect the meaning of a bacon cheeseburger. But, as much as the commercials are aired, the only close-ish Sonic for many Angelenos may be in Duarte (they are, however, found everywhere in the Orange County). Do Sonic have some of the best tater-tots in the Southland? Possibly not; the exterior sometimes lacks the crunch, and the inside can be moist to a fault. But it&apos;s also worth mentioning that Sonic is open till 2 a.m.—where else are you going to soothe your tot cravings at one in the morning? Plus their drinks—from the "limeades" to the fruit slushes—are the perfect way to stay hydrated during a marathon of heedless tot consumption. Sonic is located at 1070 E. Huntington Drive in Duarte and parts of Orange County.